When Rebecca Evans arrived on site for the construction rehabilitation of Virginia’s Todd Lake Dam (TLD), she was certain of one thing: she would be the only female on the project site. Although mentors taught her surveying fundamentals with traditional tools, she schooled herself in the advanced GNSS and robotic total station technologies as well as AutoCad Civil3D. With each new skill, new technique and new technology that she mastered, Evans the student eventually became Evans the teacher, mentoring and instructing her NRCS colleagues on both survey technology and AutoCad software. That increased knowledge and ability also pushed her up the career ladder, rewarding her with more responsibilities and more opportunities to learn in her present position within NRCS’ watershed dam engineering department. “Now I can combine the best of both worlds of engineering and surveying,” says Evans. “As an engineer I get to envision and plot the design of a dam and as a surveyor I get to be part of the team that builds it. I get to plan, multi task, problem solve and use advanced survey technology to ensure everything is right.” The extensive, $3 million (US) Todd Lake rehabilitation project would be Evans most recent opportunity to wear both her engineering and surveying hats. 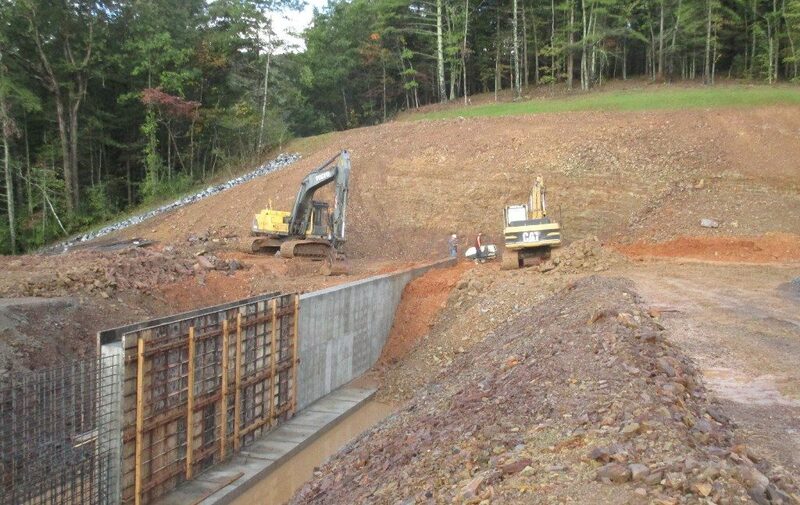 Located in Stokesville, the TLD was originally built in 1963 and is one of 16 flood control dams in Augusta County. Since its construction, the area around the dam has seen significant residential developments, increasing the risk of loss of life should the structure breach. After a routine inspection of the dam by the NRCS and the Virginia Division of Dam Safety in 2008, the TLD was reclassified as a “High Hazard” dam. The new designation triggered the need for a substantial upgrade for the existing TLD to have the capacity, stability, and integrity to handle water volumes of storm events of a specific size. To meet the new standards, the NRCS issued several construction requirements. The most significant elements included widening an auxiliary spillway from 250 feet to 300 ft; moving a road; raising the dam 2.7 ft; replacing a riser tower; building a concrete cut-off wall; laying articulated concrete blocks; and building a rock toe drain. As the majority funder of the project, the NRCS oversaw the entire project, making Evans responsible for producing all the surface modeling for design, creating construction drawings and topographic maps, calculating volumes and quantities and providing high-precision survey data both before construction and during. As the TLD was also designed to trap sediment and prohibit it from moving downstream, it was important to understand how much sediment had been collected in the lake over the past 54 years. If the sedimentation was near capacity, then the reservoir would need to be dredged. Accompanied by a geologist, Evans conducted a sediment survey––her first ever––to accurately measure the sedimentation volume to determine if a dredging project for the lake was needed. The immediate challenge was how to keep the drifting boat still and the rod in a straight line in order to acquire an accurate survey measurement of the lake bottom. In addition, although the lake is only 15 ft at its deepest, it was still too deep for the standard range pole. To resolve both issues, they set up a string line across the 7-acre lake as a fixed, linear guide and they attached four, 5-ft range poles to their Trimble R8 GNSS receiver. Following a criss-cross pattern, they lowered the Trimble R8 rod until it hit the sediment layer and quickly took a shot. Then they pushed the pole down through the sediment until it met the hard bottom and collected another point. Both measurements were saved into their Trimble TSC2 controller running Trimble Survey Pro software and they navigated to the next point in their 50-ft-by-50-ft grid. Evans completed the survey in one day and collected 300 points, all of which were imported into Autocad Civil3D software to create top and bottom surface models. Then she calculated the sediment volume, which totaled 9 acre-feet––a level low enough not to need to dredge the lake. Once construction crews began rolling onto the 13-acre TLD, Evans was on the job site every day. 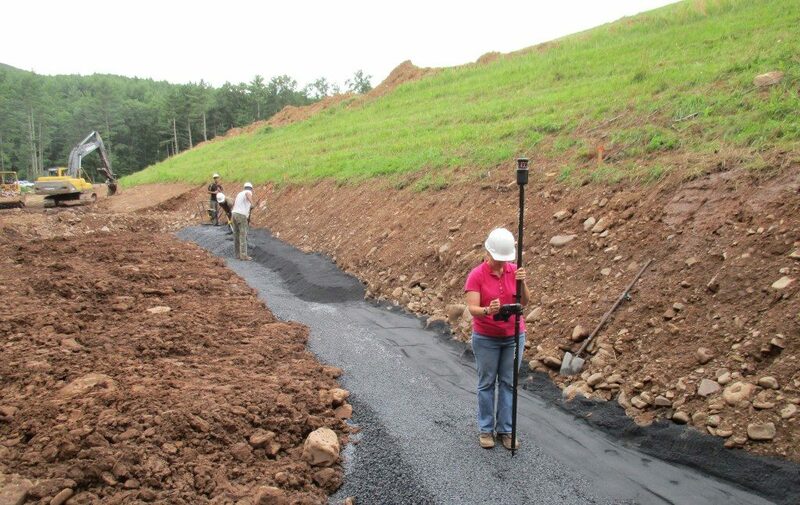 With a Trimble R10 GNSS receiver in one hand and a TSC3® collector in the other she performed stakeouts and verified the accuracy of the survey contractors’ stakes, acquired survey data, calculated quantities and volumes, took as-builts and confirmed that all infrastructure elements were being installed according to her design specifications. Sometimes, she was also correcting contractors’ mistakes and defending her data. It was also particularly gratifying to triumph over some of the more challenging aspects of the project. For example, building the 330-ft-long cut-off wall, which crosses the auxiliary spillway, not only required precise layouts and as-built data, it also required constant monitoring and a healthy dose of physicality. As the top of the concrete wall formed the floor of the auxiliary spillway, teams needed to ensure it maintained a straight line and that it was built to the exact elevation required: once the 13.5-ft-high wall was completed, it would be backfilled with earth. In addition, the wall would be 30 feet longer than the spillway, ending 15 ft beyond the spillway toe on both sides, and there would be a six-ft-deep concrete keyway underneath the wall, adding more depth to the earthworks. Evans used the R10 to stakeout the start and end points of the wall and calculated to what depth crews had to dig to accommodate both the keyway foundation and the 1.5-ft-thick wall. To achieve the correct height, they needed to dig a wide trench that ranged from 20-ft to 50-ft deep. Once the earthworks began, Evans had to regularly work at the bottom of the trench with the R10 to confirm both the depth and the trench alignment. “We were really impressed that we could use the technology at the bottom of that deep hole because the sky view was pretty limited down there,” says Evans. “Even at the furthest depth of 50 feet, we were still able to achieve accuracies to within a tenth of a foot. And as I had to go into the trench multiple times, I appreciated that the instrument is light and quick. Once they were ready to pour the concrete, Evans regularly monitored the installation because the wall was built in 30-ft sections, making it vulnerable to veering off course. Each time a wall section was started, Evans used her R10 to recheck the centerline alignment and after each concrete pour she verified the wall elevation to within five hundredths of a foot. Two months and 32 concrete pours later, the wall was completed and Evans took the last as-built. Equally critical and challenging was replacing the existing riser tower, which regulates water levels through a gate system, with a new riser 18 ft further upstream. Of principal importance was that the tower was built to an elevation that would allow the lake level to be the same as before. Also, crews had to connect an 18-ft concrete pipe to the dam’s existing spillway pipe in order to move the tower so the position of the tower’s foundation needed to be exactly right. Before the riser was demolished, Evans scaled it with the R10 and surveyed the top to verify that the top of elevation on the design plans was correct. 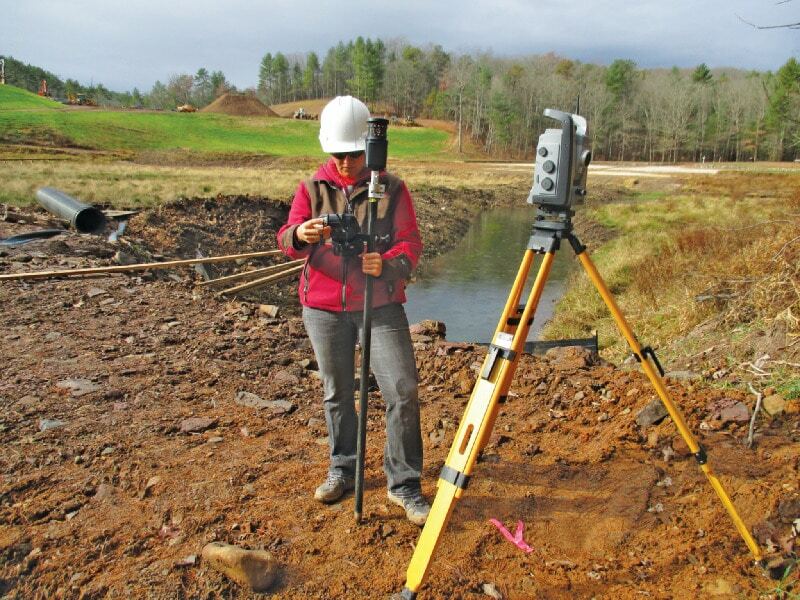 To be absolutely certain of her measurements, she also surveyed the top with a Trimble VX™ total station*. Construction teams then laid the pipe and built the riser according to Evans’ specifications, and she regularly verified the location and elevation of each new segment installed. With each of the five concrete pours needed to complete the tower foundation, Evans used both the R10 and the VX to check the elevation accuracy. Each time, they were precisely right. As beneficial as the survey technology was, however, there was one particular construction task for which the equipment was inadequate. In fact, no one was qualified for the job except Evans. Since the existing principal spillway pipe had to be extended 18 ft for the new riser tower location, the joint between the new 40-inch-diameter pipe and the old pipe had to be checked to ensure its integrity. Evans was the only one who could fit in the pipe. “Sometimes, my size is of benefit,” she says, laughing. “I have never had any problems with physically doing this job. In fact, the physicality of survey work is one of the reasons I enjoy it so much. I may be slight, but I’m strong. Indeed, although Evans stumbled into surveying, she is on firm footing now, anchored by her penchant for learning––obtaining her surveying license is next. 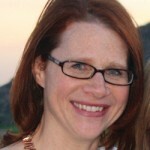 She welcomes many aspects of her work––problem solving, multitasking, unexpected surprises and new learning experiences. And she remains undeterred by the skeptics. There is, however, one certainty of her trade that she would most like to change: being the only female on job sites. Article by Mary Jo Wagner.